It is estimated that the development of a new anticancer agent costs US $800–1,000 million and takes over a decade between conception and approval. However, 90% of novel antineoplastic drugs fail in the clinic despite evidence of antitumor efficacy in classical preclinical models. This raises serious concerns whether such models are predictive of drug efficacy in humans, supporting the development of alternative approaches. Furthermore, a general transition has been observed from the empirical drug screening of cytotoxic agents against uncharacterized tumor models to target-orientated drug screening of agents with defined mechanisms of action. New approaches to anticancer drug development involve the molecular characterization of models along with an appreciation of the pharmacodynamic and pharmacokinetic properties of the tested drug. 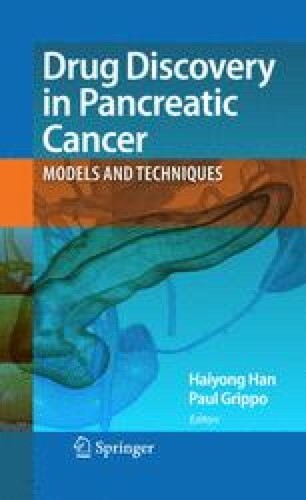 This chapter focuses on the classical and new preclinical screening models and techniques for anticancer drug development.